The January 2017 issue of the MosquitoGram has been uploaded to the Newsletter page. Also added were several events to the Upcoming Events page. Finally, the countdown to MosquitoCon timer has been set on the main page. Less than 90 days to go! 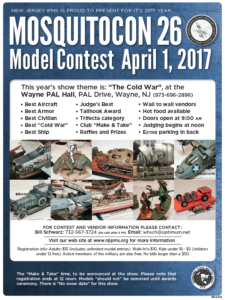 This entry was posted in Model Shows, MosquitoCon, Website Updates by New Jersey IPMS. Bookmark the permalink.